Nicky Brett has completed a full set of World Indoor Championship titles available to him at Potters Resort. The world number one from Yaxley added the mixed pairs to the pairs and singles titles already pocketed when he teamed up with Scotland’s Claire Johnston to defeat Scotland’s Paul Foster and England’s Rebecca Field 7-6, 7-9, 2-1 in a pulsating final that drew a standing ovation from the packed crowd at the Norfolk venue this afternoon (January 24). Brett produced some scintillating conversion shots, particularly in the opening set and especially in the dramatic tie-break when he twice drew within inches of the jack to first save the match and then clinch it. Brett and the left-handed Johnston edged the opening set 7-6 after leading 5-0 at one stage, but lost the second, 7-9, conceding two on the last end. 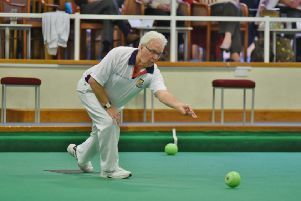 Foster and Field struck first in the tie-break and looked to have one hand on the trophy in the second end until Brett produced a stunning draw shot within inches of a re-spotted jack to force a decisive third end, and that after extricating himself from a match lie against with the previous bowl. Brett and Johnston held sway in the third end until Foster nominated to ‘kill’ the end, which he promptly did. On the replayed end, Foster was under pressure again before running the jack through to the ditch, leaving Brett little more than a foot or so to save the match, and once again the local bowler produced another gem of a delivery within inches of the ditch with Foster’s final delivery just toppling over the edge. Brett will be hoping to carry that form over to the singles tomorrow when he faces 71-year-old Scottish qualifier Charles Bence for a place in Friday’s quarter-finals, the Scot having shocked 16th seed Mark Dawes in the first round. The defending champion was given a searching examination in Monday’s opening round by qualifier Andrew Kyle, from Ireland, before winning 10-5, 8-8, but he was 4-1 down in the opening set and 8-4 down in the second before scrambling home.